The single slide on this folding pop-up camper helps to open up the floor space. 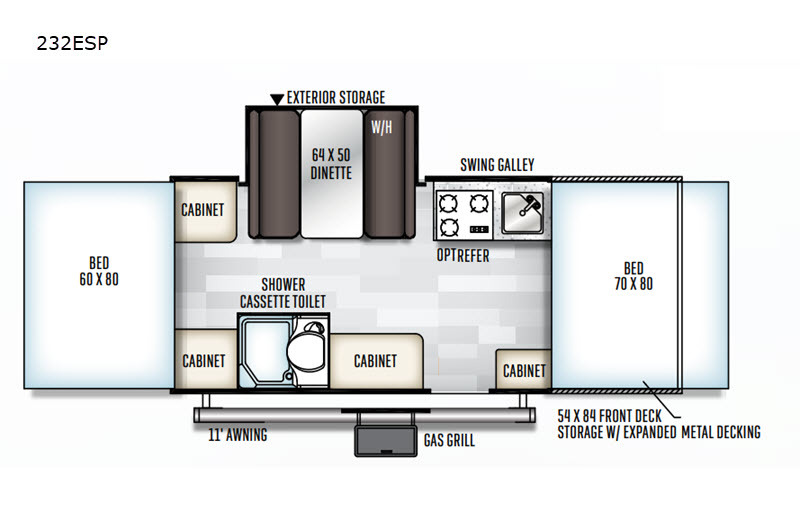 As you enter this Rockwood Extreme Sports 232ESP by Forest River you will find a shower cassette toilet, a rear queen tent bed and a front king bed. Plus there is an exterior front deck for storing your toys and outside gear, as well as an additional exterior storage with the booth dinette slide out. 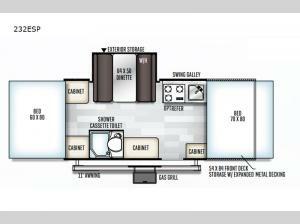 You can not only enjoy your meals at the booth dinette, but also transform it into an extra sleeping space at night. Don't leave behind any of your favorite camping goodies because you have four, yes four cabinets to store them all in! So, grab a snack and a chair and head outside underneath the 11' awning and enjoy some fresh air without getting a sun burn.